Wanna hear something kind of pathetic? Up until recently, I hadn’t been on a bicycle in nearly 20 years. If it weren’t for my husband’s brief ownership of a mountain bike 18 years ago, I’d be able to say it had been more than 30. Except for my husband’s bike, I never really learned how to use gears or handbrakes. I know. Sad. I’ll spare you the long, tragic part of that story and skip to the last 10 or so years. I actually did spin classes for a while. Then people started crowding into the room in anticipation of their classes. They’d find the bike they wanted and stand next to it. During the last 10 or 15 minutes of the currently ongoing class. Then there was a small revolt when an instructor asked them to leave. Doesn’t leave you feeling safe. And then the gym made a new policy of making the instructor keep all the lights on. No, it’s not because then I could really see myself (and everyone else) in the 2 walls of mirrors. It’s because all those lights causing a glare from the mirror was hard on my eyes, made them hurt. And thanks to all those people invading, the instructor had to keep the door closed – a marginally effective deterrent – and it was hotter than hell in there. You could sit in the corner for an hour and sweat just as much. So there’s that. But stationary bikes aren’t really the same. The other thing is that I completely shattered my elbow 14 years ago. My right arm no longer does all the fun bendy things my left arm does. So handlebars are an issue. Plus, I live in an area where there are lots of big-time bike races and tons of serious-looking bike riders. I know someone who trains for triathlons. It’s intimidating as hell. Plus, I’m not itching to wear those little spandex bike shorts any time soon. 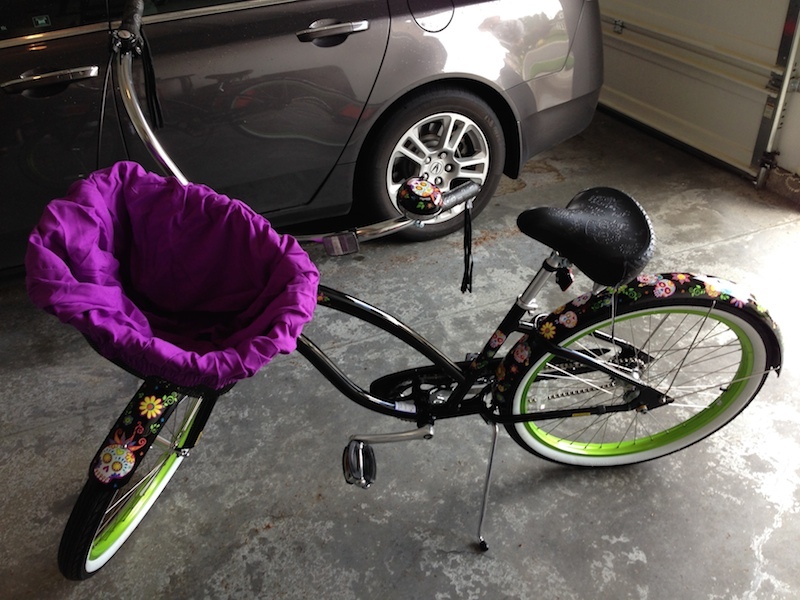 Then Desirée got a bike for her birthday. She showed me a picture. Holy hell is it cute! And it has a larger seat, so the over-40 goodies don’t get sore or, worse, fall asleep. Handlebars like the kind most of us had as kids. Only 3 gears. Foot brakes. Basket. Bell. So I got a new bike a couple weekends ago. Miss D and I went to a trail near my house and rode the entire thing and back, for a total of 6 miles. 6 miles! I think it’s safe to say we both felt like little kids again. I was wobbly. I went off the paved trail a few times. But I’m getting my balance back. It was fabulous to have the wind on my face like that again. And to have somebody to talk to and, most importantly, laugh with. We celebrated afterward with lunch. We felt so good we got salads. On top of that – and you might want to be sitting for this – we opted to pass on the chocolate. Shocking, I know. Point is, we had a great time, got a little vitamin D and some physical exercise, let the endorphins kick in. I’m sure there’s probably some official explanation about how letting go and allowing yourself to feel like a kid is beneficial to your mental health. Get a bike (or dust it off if you have one), slather on the sunscreen, and GO! Filed Under: Health, Let's Get Physical, Mood Swings, WHEEEE! !